After a travel or holiday, you may have many photos for sharing with families or friends. 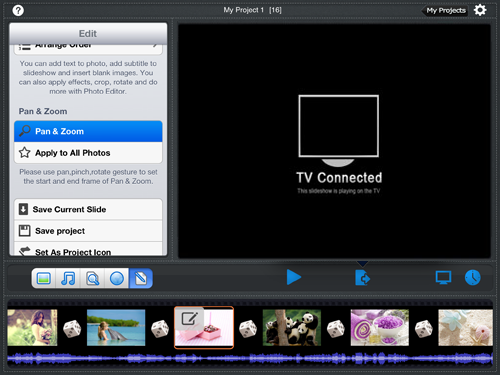 If you are trying to play your photos as a slideshow to TV from iPad, you may need to make some preparations. First you need to create a slideshow on iPad. Then you need to have Apple Digital AV Adapter and HDMI cable to connect iPad with TV. Finally, you can mirror iPad slideshow to TV. 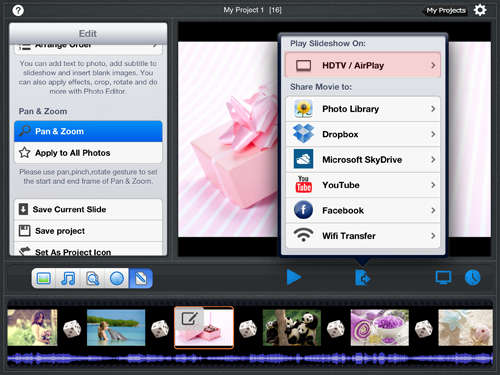 You can easily make a slideshow with Photo Slideshow Director HD(App Store Link). Just need to add photos and music into the app, then an eye-catching slideshow is ready to showcase. Wanna import photos from web albums? No problem, the slideshow maker allows you to get photos from Facebook, Flickr, Picasa, Dropbox , SkyDrive and Instagram by signing into your accounts. Also you can add text and subtitles to express your feeling or describe photos, select transitions and set pan / zoom effects, choose a theme, set duration for slides and transitions, etc. Its built-in powerful photo editor enables you to edit your photos before sharing, such as rotating, cropping, adding effects, enhancing, and etc. Turn on your TV. 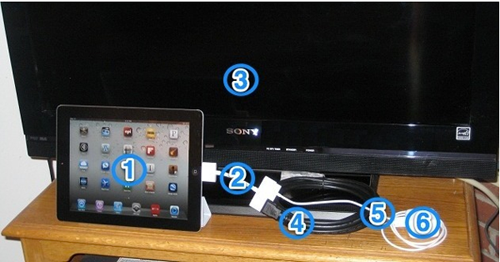 Connect the Apple Digital AV Adapter to your iPad via the 30-pin dock connector, and to your HDTV via HDMI cable. Then change your TV input to HDMI port. Now your iPad screen should be mirrored to TV. If you want to have your iPad changed while streaming, a second 30-pin connector built into the AV adapter lets you charge and sync your device while it’s connected to your TV. Tap the Export icon, you will see all available options to share the slideshow, including saving slideshow to Camera Roll, posing to Dropbox / SkyDrive / YouTube / Facebook, transferring to PC over WiFi and playing on HDTV. Tap HDTV / Airplay under Play Slideshow On list. Now it shows TV Connected in the main screen of Photo Slideshow Director HD. And your TV is showing a still picture. Tap the Play icon( ), the slideshow will begin playing on your TV in full screen. The app supports 1080p HD video slideshow, so your photos will look great on TV. This entry was posted in Best ipad slideshow app and tagged mirror photo slideshow to tv from ipad, play slideshow from ipad to tv, show ipad slidesho to tv, showcase ipad slide show to HDTV on May 14, 2013 by Sarah Jablich.